Prairie Hill Cohousing, the first cohousing community in Iowa, welcomed its first four households in March 2018. By the first anniversary in 2019, more than half the 36 homes had been sold and the Common House had been completed. Additional homes are available for finishing with materials and fixtures of new owners’ choices. More will be built as they are sold. 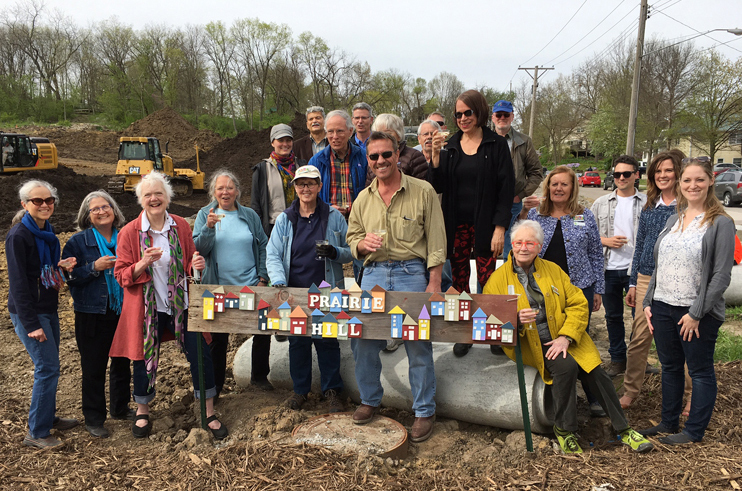 Iowa City Cohousing is developing Prairie Hill as a multigenerational eco-community on an 8-acre infill site in a cosmopolitan city of 70,000. We are located on bus lines and biking and walking trails about a mile from the University of Iowa and downtown Iowa City. Prairie Hill is adjacent to a small city park and near a large new multifaceted city park. There are numerous restaurants and businesses to meet most of a person’s everyday needs within walking or biking distance of Prairie Hill. Nearly four acres of our site has been reserved for gardens, prairie, orchard, and open space. We have been awarded state grants to support sustainable stormwater management practices on our site. As we develop both the open space and the land around our homes, we are following permaculture principles. Committed to being a diverse, inclusive community, we are especially interested in attracting families with children. Current members range in age from 6 to 81. We include current and retired teachers, librarians, a mediator, engineers, social workers, a landscape designer, a massage therapist, an editor, writers, a professional genealogist, and specialists in affordable housing. Iowa City Cohousing has been awarded grants and tax credits to build some affordable homes for income-qualified buyers. Homes range from studio apartments in our Common House to two-story, three- or four-bedroom duplexes. Other homes are configured as fourplexes, single-story townhouses, and one-and two-story duplexes. We offer homes of 645, 800, 950, 1290, and 1600 square feet. All homes are super-insulated and built to meet Energy Star and LEED certification standards. Most are sited to permit installation of solar panels on their roofs. Iowa City ranks high in many national ratings of desirable communities, including 4th best place to live in America, according to the 2018 livability.org index. It has top-ranked public schools, a major research university and world-class university teaching hospital, a thriving arts and entertainment culture, free summer festivals, and Big Ten sports. It was the first UNESCO City of Literature in the country, home to the renowned Iowa Writers’ Workshop and excellent independent bookstores. Iowa City and the University of Iowa have silver ratings as a bicycle-friendly community and university, respectively according to the League of American Bicyclists. The city is the site for the first event in the 2019 World Cyclo-Cross World Cup series of international races. Interested in politics? Iowa is home to the first-in-the-nation political caucuses, and you would have the opportunity to meet most primary candidates somewhere just across town in the library, a restaurant or a private home. Most of the announced candidates in the 2020 presidential race have already been to Iowa City, and they are likely to come again.